These are questions and topics of discussion that often come up in conversation with musicians, students, and music enthusiasts in general. I've had many fond musical experiences so far, and I hope that you will enjoy hearing about some of them. Please feel free to email any additional questions or topics of discussion. What do you enjoy the most about playing music? Do you ever play any strictly Latin jazz gigs any more? How do you choose your musical repertoire? So, what IS your most frequently asked question? What memorable live jazz performances have you seen/heard recently? What guest artists have you played with who were really memorable? Is there a Central Illinois musician has been particularly inspiring? Speaking of Central Illinois musicians, who is Doc Scott and what is your favorite tune of his? Do you work with other Central Illinois jazz musicians/composers? What about your jazz days in Iowa? What and where is this place called "Panache?" Have you played in any strange situations? What do you think of "smooth jazz?" What do you think of “pop” music these days? Have you ever played in any rock bands? Did you really get sixth place in Neil Peart’s drum giveaway in 1987? What do you enjoy about teaching music? Do you play drum gigs these days? I like to have a repertoire of music that has some musical depth and diversity that we musicians can dig into, but at the same time can be accessible to a general listening audience. That’s where arrangements are important, and I guess that explains my occasional jazzed-up versions of well-known pop tunes too. I don’t want to come across as being “difficult” to listen to, so I try to choose, transcribe, write, and arrange stuff that can satisfy us musicians, while also striving to be somewhat accessible to various listeners. Clark Terry was another memorable legendary jazz musician to work with, once in the late 1980’s with the Eastern Illinois Jazz Ensemble, and a second time in the early 1990s with Tom Birkner’s University of Illinois Jazz Ensemble. 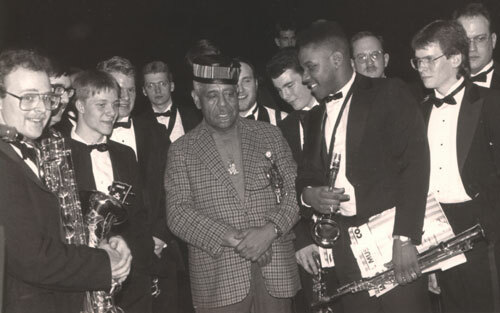 Like Dizzy, Clark was friendly, respectful of everyone, and made us feel very comfortable, and his musicianship is just outstanding! Playing drums with jazz organist Jack McDuff in the mid 1990s for Champaign-Urbana’s jazz and blues blowout was also a ton of fun. He was full of surprises. It was a lot of fun going with him wherever he decided to go musically at the moment, and it felt so good to play with someone who swings that hard! What musician hasn't?? Here are some that come to mind right now. I put a jazz group together to play for a wedding, and the bride and groom wanted plenty of Miles Davis, Frank Sinatra, and Dave Brubeck. So we played some classics by these artists, and a few couples would come out and dance here and there. So then we went into Dave Brubeck’s “Take Five” thinking that no one would want to dance to this tune in 5/4. Wrong! People ran to the dance floor like a bunch of kids running to the playground for school recess. The dance floor was just packed! Then we went back to the regular standards in 4/4 with a few dancers here and there. Then later on, someone came up and requested “Take Five” for the people who were outside and missed it the first time. So we went into “Take Five” for a second time and it was like some magnetic force pulled everyone onto the dance floor! It was a fun time, but definitely an unusual wedding gig. I once played drums with a piano trio at a restaurant in Urbana, and the manager kept telling us after every tune that we were too loud. Now I have already been playing the entire gig very lightly with brushes, the bass player was playing totally acoustic, and the pianist had his rig turned way down. So I decided to have a little fun with the situation. When the piano player called “Cute,” I proceed to play brushes, but never touched the drums, I just pretended to. I was basically playing air drums. The only sound you could hear from me was the sound of my brushes going through the air. After the tune was over, the manager came over and asked us if we could turn down even more! Another strange gig was at a pumpkin festival in Central Illinois. I was playing keyboards with a small group hired to play little interludes between a pumpkin chunkin’ contest. We were up on a tall stage in the middle of a plowed over cornfield playing some funky-jazzy kind of stuff for maybe a couple of minutes at a time, being almost totally ignored. But when they started flinging those pumpkins though the air, the crowd just went wild! I kept asking myself “what planet am I on?” After an afternoon of that, I couldn’t wait the get out of there! In high school, a few of my friends and myself would spend hours figuring out and rehearsing Rush tunes for talent shows that would get canceled year after year, until finally my senior year when the school finally backed a talent show. Of course we had been working on this stuff for a few years at this point, so we were pumped and ready. Although our show seemed to go over very well, we were supposedly disqualified by a student judge for being “too professional.” We did get a rare opportunity once to display our progressive rock talents at a girl’s basketball game intermission. High school was definitely an interesting time.